There is only so much time we have on earth. In Western culture, it is very common to look at time as something that behaves linearly: a straight line on which there is a past behind us, a present that feels more like a tiny little ungraspable dot, and a long future that stretches out before us. 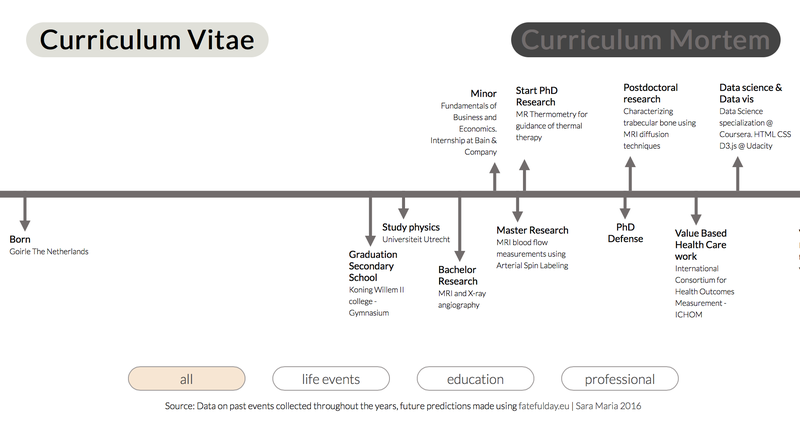 Mapping my Curriculum Vitae and Curriculum Mortem on one of those linear timelines resulted in the following interactive visualization, which takes you from 1980 all the way to 2054. Curriculum Vitae and Mortem. Click on the image for an interactive view.